I spent a while today getting a paper near to completion so I'm going to treat myself to another quick blogpost from Morocco. Things become out of sequence at this point and there's a whole desert/sandstorm/escaping drunk angry locals/camel riding saga to explain at some point. However, skipping that for now, having stayed in the desert for a night I took a bus for ten hours and then a train for 6 to arrive at Rabat where I spent a night and a morning, looking around the local souk. It's an extremely relaxed city, with a lot more colonial influences than Marrakesh. For this reason alone I didn't particularly feel like spending a lot of time there, simply as it didn't feel like the Morocco I was looking for, so the next day I took a train another 6 hours to Fes, which truly felt like Morocco real, even with the hordes of tourists. I spent an extremely enjoyable couple of days there getting outrageously lost in the old market area and eating as much street food as I could lay my hands on (the avocado juice in particular was stunning, even if it contained more refined sugar than it did avocado). 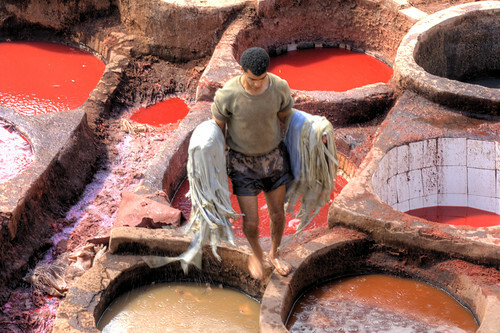 Anyway, the main reason I'd wanted to go to Fes was to see the tannery and it didn't disappoint. Down a dark alley in the heart of the medina you are drawn by the stench of tanning leather, up a series of winding stairs and through a maze of escheresque buildings, until suddenly you come upon a sight quite out of this world. With colours and activity absolutely in your face, this uncovered factory has been like this for an age. So, I stood there and watched from the platform above as the very real activity of turning animal hide into a usable clothing material unfolded before me. This flickr set can be found here and the current batch of Morocco photos, here. More to come.